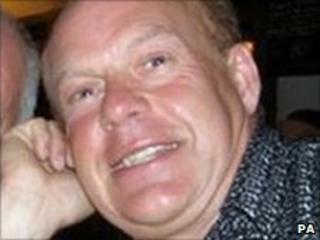 The funeral of gunman Derrick Bird has taken place. The taxi driver killed 12 people and wounded 11 others during a 45-mile rampage across west Cumbria on 2 June, before turning the gun on himself. A private service was held at Distington Crematorium, with the time and location kept secret until the last minute. Before the service the Rev Jim Marshall said he hoped the funeral would give a sense of hope to the community. Earlier on Friday, the funeral of his youngest victim, Jamie Clark, took place in Luton. Bird's funeral, conducted by Mr Marshall, curate of St Michael's Church in Lamplugh, was attended by about 100 people. Among the mourners was taxi driver Paul Wilson, who was shot and injured by Bird. Family members, including both his sons and his former wife, arrived in a coach. Derrick Bird's mother, Mary, is currently in hospital and did not attend. Nor did the family of his twin brother David, Bird's first victim. David Bird's family said in a statement: "We send our love and support to our grandma, auntie, uncle and cousins on this difficult day. "As you can imagine this has been a very hard time for our family and at this present moment we do not feel physically and emotionally strong enough to attend the funeral. "However, we would like to express our love and support to the rest of the family." Bird's relatives had wanted his funeral to be held after those of his victims as a mark of respect to them. Speaking before the service, Mr Marshall said: "I've described endlessly to people about the good man, the nice man, the loving, caring man that he was. "And on the day, that dreadful day, there was another man doing the things that he did." For the mourners who attended the funeral their presence was a bold statement, and some hid their faces from the strong media presence camped outside. Before the funeral many acquaintances who did not attend told me they refused to pay their respects to a man who had committed "such a violent and traumatising crime". For others, though, it was an opportunity to say farewell to the man they had known for 52 years before the events of 2 June. Tragically for his family, Derrick Bird will not be remembered as a loving father, son and brother, but as one of Britain's most violent gunmen in recent history. During the funeral there was an address by one of Bird's friends, Keith Wilkinson. He said that he had first met him at the village school in 1969. "Inevitably we all have to grow up," Mr Wilkinson said. "Who would know that one day someone so very close to us would break down, his mind lost to darkness and despair, and would be the cause of such loss and tragedy. "There but for the grace of God go I." After the funeral, a statement was released by a family friend, Brian Spencer, on behalf of Bird's sons. It read: "Derrick was many things to many people but to us he was just dad. "To us he was a loving and caring family man, well-known and well-respected in our local community. "We will never understand what was going through his mind on Wednesday 2 June or why he killed and injured so many people. "All we can say is that we are utterly devastated by his actions and deeply saddened by the legacy of pain he has left behind. "Our love, thoughts and sympathies are with the families who are suffering at this time. "We will miss our dad greatly and hope that we, along with all the families who have been impacted by this crime, can somehow try to move on and try to rebuild our lives."